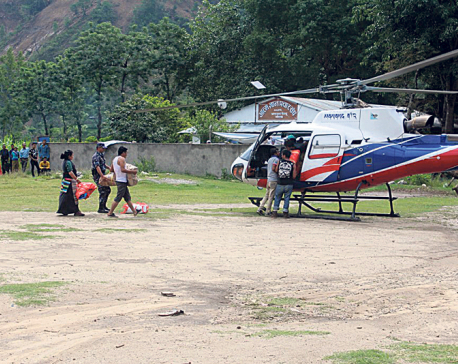 A chartered helicopter waits to arilift Sarita Gurung of Darche village, Gorkha to Kathmandu for treatment. GORKHA, July 30: Sarita Gurung of Dharche village was rushed to local health center following labor pain. When the health center could not treat her citing lack of expertise and equipment needed to treat her, she was taken to TU Teaching Hospital in the capital on Friday. 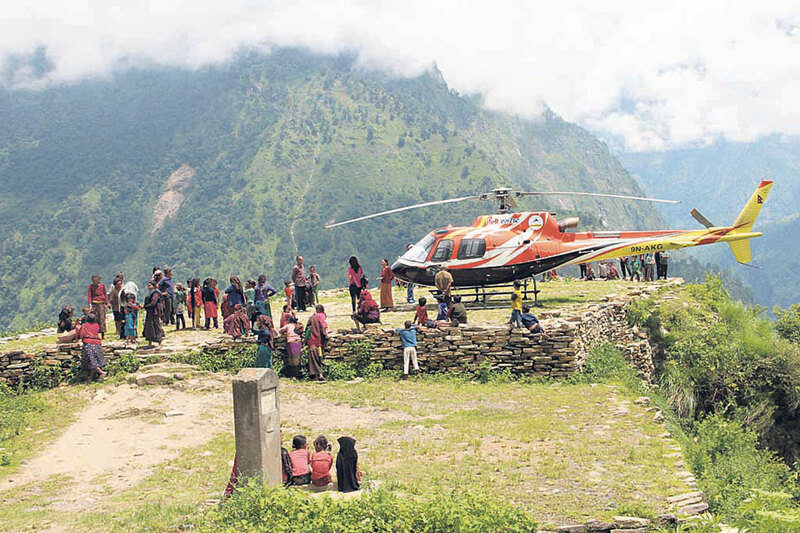 The family had to airlift her to Kathmandu as the place she lives in the northern part of the district is not connected to roadways. Though the chopper service cost her family dearly, they had no choice other than that. The cost paid off. After surgery at the hospital, the 29-year-old Gurung gave birth to a baby boy. Medical services are available in the district headquarters as well. However, Gurung’s family opted for Kathmandu as it would have taken two days of walk for reaching there and they feared that she could not have made it. On July 23, Maya Gurung of Laprak village also had labor pain. She endured it at home for three days, but could not deliver baby. Ultimately, as her health deteriorated, the 24-year-old was also airlifted to Kathmandu and brought to the same hospital where she gave birth to twins. On the first of July, Pasang Bhuti Lama was on the verge of death while delivering baby, her family members said. During the delivery, only half of the baby’s body came out and local medics could not get the baby out. Her family chartered a helicopter and rushed her to the Paropakar Maternity and Women’s Hospital in Thapathali. She was saved by the doctors but the baby died. 68-year-old Desh Bahadur Gurung succumbed to ailments last week in district headquarters. The family had to take his body to their native village in the northern part of the district. They had to transport his dead body by chartering a helicopter which cost the family Rs 130,000. These are just a few example of Gorkha people’s dependency on helicopter. Basically during emergency health cases, they are bound to spend thousands of rupees for transportation service. Families which cannot afford often lose their loved ones. District Public Health office sometimes extend financial support to the women needing delivery service. However, that is not always the case and all people don’t know about the service. “There were three critical delivery cases within one month and for them, we recommended the Regional Health Directorate to pay their helicopter fare,” said Kedar Parajuli, chief of District Health Office, Gorkha. Officials say that though there is budget for providing airfare in cases of critical health emergencies, only few claim it due to lack of awareness. “People have to go to Kathmandu or elsewhere even for small health problem. What to do, we have serious lack of instruments, infrastructures and human resource in remote areas,” said Parajuli. “The state should address these shortcomings by introducing separate policy for remote zones,” he added. Seven wards of the Chumnurbi Rural Municipality and three wards of Dharche Rural Municipality are not linked to road network. Residents there have no choice other than to walk through steep hills. It takes from one day to a week for those people to reach district headquarters. “The routes we use are not safe at all. It’s very risky to tread on those trails and more so when you are sick or carrying a sick person,” said Nanibabu Dani, who works at a remote health post in Gorkha. “Though we are here to provide health service to the people, they are bound to go to Kathmandu if we cannot provide the treatment. And since there are no roads, they are forced to charter helicopter, if they can afford,” he added. Dani said that many of such people are forced to take debt in high interest to pay for chartering the helicopter. “When all their efforts exhaust, airlifting the patient and treating in Kathmandu is the villager’s ultimate hope. For this they even take loans at steep interest rates,” Dani said. Dhan Bahadur Gurung, Chief of the Chumnurbi Rural Municipality stated that access to better health services is one the biggest need of the people in rural Gorkha. “Those who are poor and cannot get debt on time have no choice but to wait for death. Getting accessing to better health services is our biggest need,” he said. “Those who are resourceful and have affluent kin in the city afford chartering helicopters easily. And those who are influential do get loans at better interest rates. But there are many helpless people who die untimely,” he narrated. He added that lack of road linkage to several villages and costly fares - even in places where road transportation is available - has been a serious setback for the residents of remote areas.